Posted on February 28th, 2019 in Goat's Forecast. Time for another of TG’s patented Singalong Surf Forecasts …for the last day of Summer….Try getting this out of your head! Can you (or rather TG !!) handle the pace?? Surf rest surf relax, and repeat……….. Partly cloudy. Winds northeasterly 15 to 20 km/h, tending 25 to 30 km/h about coast. Partly cloudy. Medium (40%) chance of showers, most likely during the morning about the coast, and during the afternoon and evening in the west. Light winds becoming easterly 15 to 20 km/h during the afternoon, tending to 20 to 30 km/h about coast. Partly cloudy. Medium (40%) chance of showers, most likely in the morning about the coast, and during the afternoon in the west. Light winds becoming northeasterly 15 to 20 km/h in the late afternoon, tending 20 to 30km/h about coast. Partly cloudy. Slight (30%) chance of a shower. Light winds becoming northeasterly 15 to 20 km/h during the afternoon then becoming light during the evening. Sunny. Light winds becoming northeasterly 15 to 25 km/h during the day then becoming light during the evening. Mostly sunny. Winds northeasterly 15 to 25 km/h. Mostly sunny. Slight (30%) chance of a shower. Winds north to northeasterly 15 to 20 km/h increasing to 25 km/h before shifting southerly 15 to 20 km/h later. Posted on February 28th, 2019 in At large. As of 0640 wind was light from the WSW and the MHL buoy was showing 1.3 metres of 8-sec SSE bump. Magnets should be in the waist to chest range and wind should be okay until late morning, when it’ll get around to the NE. Tide is dropping to a low at 1130. Still waiting for swell in California, so herewith a few snaps from a train ride I took yesterday along the coast between Ventura and Santa Barbara. Homeless encampments like this one near California Street, Ventura are not uncommon on public land close to cities here. 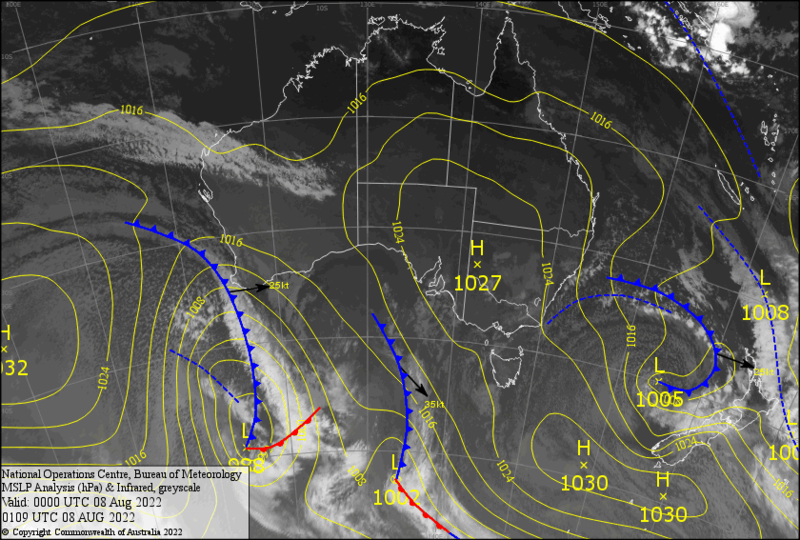 A slow-moving high pressure system over the Tasman Sea is extending a ridge to the New South Wales coast. This pattern is expected to persist into next week, bringing east to northeasterly winds to the coastal waters. The winds will tend to the north and strengthen in the southern coastal waters later on Saturday and into Sunday as a trough approaches NSW. Posted on February 26th, 2019 in At large. Swell energy in Sydney continued to fade overnight and at first light magnets looked to be maybe knee to waist – on the big ones. Wind was lightly offshore for the early and tide was running out to the low at 0900. You can expect a mostly sunny day with a high of 27 along the beaches. Water temp’s at 25C according to Beachwatch. In the middle of the night the Sydney MHL buoy was seeing 1.4 metres of 7-8 second stuff from the SSE (150 degrees). With any luck, the swell shouldn’t fade to zero over the remainder of the week, but from the look of the models it may not be much above marginal at most places most of the time. A high pressure system over the Tasman Sea is gradually weakening as a cold front passes to the south today and tomorrow. This will bring a southerly change to southern parts of the coast from late tonight and during Wednesday before a new high moves across from the west. The new high is then expected to stall over the Tasman Sea from late Wednesday, maintaining a ridge along the New South Wales coast for the remainder of the week. North to northeasterly about 10 knots increasing to 10 to 15 knots in the early afternoon. Southeasterly 1.5 to 2 metres, decreasing to 1.5 metres around midday. Northeasterly 10 to 15 knots becoming easterly about 10 knots early in the morning. Winds inshore briefly turning southerly 10 to 15 knots in the late morning and early afternoon. Southeasterly 1 to 1.5 metres, decreasing to around 1 metre during the morning. Northeasterly about 10 knots increasing to 10 to 15 knots during the evening. The next routine forecast will be issued at 4:05 pm EDT Tuesday. Posted on February 25th, 2019 in At large. Surf’s still lumpy bumpy and horrible with tide too low at most places… and the wind is onshore. Only for the desperates. 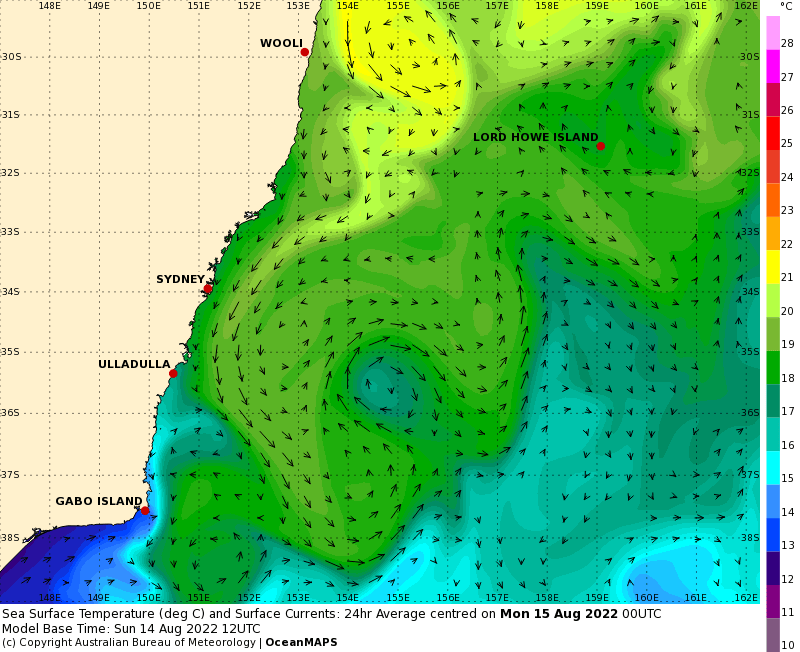 Looks like another scrappy you-could-surf-if-you-were-really-keen sort of day in Sydney. Magnet spots should deliver chest plusses, but the overall conditions are fairly marginal. For starters, the ESE wind was already 10-13 kts at 0730 under cloudy skies. As of 0400 the MHL’s directional spectrum chart for Sydney was showing a mix of NNE and SSE swell, with the latter very much dominating. First tide of the day is the low at 0755. You’re back to a moderate 1.4 m high at 1355. By then the Bureau says you can expect a light NE’r to have taken over from the SE stuff. Ocean temp is a very warm 25C according to Beachwatch, although run-off from weekend rain may put a question mark over water quality at some beaches. The story in California remains dire for surfing. Weather is perfect but there is barely a hint of a wave from Santa Cruz south. Looks like the best place to be is somewhere in the vicinity of Trestles – again. A high pressure system near Tasmania is drifting slowly east, as ex-Tropical Cyclone Oma continues northwards over the Coral Sea. Later today the high will shift to the central Tasman Sea, where it will linger during Tuesday. This system will weaken on Wednesday as a cold front passes to the south, allowing a trough to move along southern parts of the New South Wales coast, but will quickly be replaced by a new high moving across from the west. The new high is expected to be very slow-moving and should remain the dominant feature in the region for a number of days. East to southeasterly 10 to 15 knots becoming east to northeasterly about 10 knots in the afternoon. Variable about 10 knots becoming northeasterly 10 to 15 knots in the afternoon. Southeasterly 1.5 to 2 metres. North to northeasterly about 10 knots becoming easterly during the morning. Southeasterly 1.5 metres, decreasing to around 1 metre during the morning. Posted on February 23rd, 2019 in At large. So while there will be waves today and tomorrow they will be messy and bumpy at places exposed to the south. And there’s nearly one and a half metre difference between high and low tides at the moment with the full moon. ​There’s about 2.5-4 metres of dead South swell offshore, but​ on the beach it’s currently around 1-2 metres, 2ish metres​ of messy bumpy waves at open beaches​ ​. It’ll increas​e through the day from South East​ but the southerly wind will also increase. Note the BoM’s warning: Large and powerful surf conditions are expected to be hazardous for coastal activities such as rock fishing, swimming and surfing. Surf Life Saving NSW recommends only swimming at patrolled beaches and between the red and yellow flags. ​And s​peaking of Surf Life Saving…it’s always a good idea to know what to do if you or a mate need help in the surf, from a shark attack to resuscitating someone who has nearly drowned… and you can get the necessary info and training from a surf club. But did you ever think that those skills can be used in situations away from the beach? Recently a probationary surf club member successfully resuscitated a man who had a heart attack playing futsal at a local RSl..
Also check at your local surf club. As Nick Carroll says: surf clubs need surfers, and surfers​ ​need surf clubs. Both have a lot to offer each other! As I often say on ABC radio when it looks like this, it’s a real doona day. Wind is sideshore from the SSW at 10-15 kts as of first light. But it’ll pick up and swing SE as the morning goes along. And that won’t help the scrappy 2.3 metre, 8-second, SSE swell. Not that it matters much, but tide is coming in this morning to a midday high. Looks as though the Bureau expects some of that cyclonic oomph to appear tomorrow. Unfortunately the wind will be strong and SE for Sydney. Bad luck. A strengthening high pressure system near Tasmania is drifting slowly east, while Tropical Cyclone Oma lies about 600km off the southern Queensland coast. This pattern is generating south to southeasterly winds over New South Wales waters, strong to gales force in the north due to the presence of Oma. Conditions should ease gradually on Sunday as Oma moves away to the north and the high shifts to the Tasman Sea. This high is expected to become the dominant feature in the region through the coming week, bringing a gradual shift from southeast to northeasterly winds in most coastal areas. South to southeasterly 15 to 25 knots, increasing to 20 to 30 knots in the evening. Easterly 1.5 to 2.5 metres. Southeasterly 20 to 30 knots, easing to 15 to 25 knots in the morning. 2 to 3 metres, decreasing to 1.5 to 2 metres around midday. Easterly 2 to 3 metres. Southeasterly 1 to 1.5 metres. Large and powerful surf conditions are expected to be hazardous for coastal activities such as crossing bars by boat and rock fishing. Surf Life Saving NSW recommends only swimming at patrolled beaches and between the red and yellow flags. East to southeasterly 15 to 20 knots tending east to northeasterly 10 to 15 knots during the afternoon. 1.5 to 2 metres, decreasing to 1 metre during the morning. Southerly 1.5 to 2 metres, tending southeasterly 1.5 to 2 metres during the morning. Posted on February 22nd, 2019 in At large. As of 0720 the wind was lightish and from the SW, but it won’t last long. Pretty soon the wind will be coming from the SE, just like the showers wafting in from that direction. Not a nice morning and while it’s getting crazy up north from the Oma energy, Sydney is currently seeing 2.7 metres from the SSE at 8 seconds. From the cams it looks pretty lumpy and disorganised with size in the shoulder-head high range at magnets. As for the week ahead, well, it looks like a complicated story. 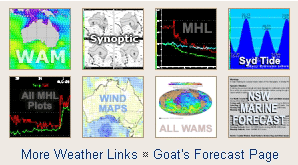 The Goat has ruminated upon the prospects and yesterday offered his take on the possibility of our seeing something vaguely reasonable from all the storm energy boiling around off the east coast. A strengthening high pressure system to the west of Tasmania will move slowly east over the next couple of days, establishing south to southeasterly winds through most coastal areas. Winds and seas in the north increase today and through the weekend due to the presence of Tropical Cyclone Oma in the region. South to southeasterly 15 to 20 knots. South to southeasterly 20 to 25 knots, reaching up to 30 knots in the evening. 1.5 metres, increasing to 1.5 to 2.5 metres during the morning. Easterly 1 to 1.5 metres, increasing to 1.5 to 2 metres during the afternoon. Southeasterly 20 to 30 knots decreasing to 15 to 20 knots during the day. 2 to 3 metres, decreasing below 2 metres during the afternoon. Southeasterly 1 to 2 metres, tending southerly 2 to 2.5 metres during the afternoon or evening. Posted on February 22nd, 2019 in Goat's Forecast. Forecast issued at 4:20 pm EDT on Thursday 21 February 2019. Cloudy. High (80%) chance of showers. Winds southeasterly 15 to 25 km/h. Cloudy. Medium (60%) chance of showers, most likely in the morning. Winds southerly 25 to 35 km/h. Cloudy. Medium (60%) chance of showers. Winds southeast to southwesterly 25 to 35 km/h becoming southeasterly 30 to 40 km/h in the middle of the day then tending southerly 30 to 45 km/h in the early afternoon. Cloudy. Medium (50%) chance of showers, most likely in the morning and afternoon. Winds southeasterly 25 to 35 km/h. Large and powerful surf conditions are expected to be hazardous for coastal activities such as rock fishing, swimming and surfing. Surf Life Saving NSW recommends only swimming at patrolled beaches and between the red and yellow flags. Cloudy. Slight (30%) chance of a shower. Winds east to southeasterly 15 to 25 km/h becoming light during the evening. Partly cloudy. Slight (30%) chance of a shower. Light winds becoming east to northeasterly 15 to 20 km/h during the day. Partly cloudy. Medium (40%) chance of showers. Light winds becoming southeasterly 15 to 25 km/h during the day. Partly cloudy. Medium (40%) chance of showers. Light winds becoming east to southeasterly 15 to 20 km/h during the day. Posted on February 21st, 2019 in At large. No better here in Santa Barbara, or most of the rest of California. The only place I spotted a wave on the cams was at Pismo Beach (about 2 hours north of where I am) which was offering feeble waist plusses. Santa Cruz was flat and so was Windandsea in San Diego… you’re missing nada!